Explanation: How many of these can you find in today's featured photograph: an aurora, airglow, one of the oldest impact craters on the Earth, snow and ice, stars, city lights, and part of the International Space Station? Most of these can be identified by their distinctive colors. The aurora here appears green at the bottom, red at the top, and is visible across the left of image. Airglow appears orange and can be seen hovering over the curve of the Earth. The circular Manicouagan Crater in Canada, about 100 kilometers across and 200 million years old, is visible toward the lower right and is covered in white snow and ice. Stars, light in color, dot the dark background of space. City lights appear a bright yellow and dot the landscape. Finally, across the top, part of the International Space Station (ISS) appears mostly tan. The featured image was taken from the ISS in 2012. A question about today's photo: Really is the curve of horizon seen from ISS? Or is it an optical effect for using a wide angular objective?. Thank a lot. A question about today's photo: Really is the curve of horizon seen from ISS? Or is it an optical effect for using a wide angular objective?. Go to curve of the Earth and see if you can answer your own question. I see clouds too, which could be in the list. Question: What is the cause of the green boundary layer (not the aurora) just above the limb brightened part of the orange airglow? Manicouagan is not even close to being one of the oldest craters. Actually relatively young. Over 95% of the earth's history had already passed by the time it formed. Imagine a movie of this !!!!!! By the way, I just watched yesterday a photo of the Earth eclipsing the sun taken by the Apollo XII astronauts. WOW !! 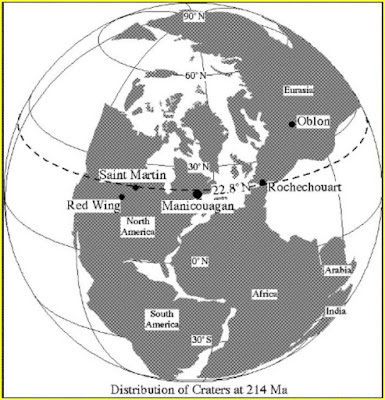 <<Plotted locations of the craters thought to be part of a hypothetical multiple impact event, forming the Manicouagan crater in the Côte-Nord region of Québec, Canada, the Rochechouart crater in France, Saint Martin crater in Manitoba, Obolon' crater in Ukraine, and Red Wing crater in North Dakota. Geophysicist David Rowley of the University of Chicago, working with John Spray of the University of New Brunswick and Simon Kelley of the Open University, discovered that the five craters formed a chain, indicating the breakup and subsequent impact of an asteroid or comet, similar to the well observed string of impacts of Comet Shoemaker-Levy 9 on Jupiter in 1994. It's older than 90% of the identified craters on Earth, though. Reference? I am a bit doubtful. In any case not statistically or geologically meaningful, because ALL rocks, of any origin, become much scarcer with time, due to plate tectonics and erosion. The smaller and younger craters, which are heavily over-represented in the "confirmed" category, because of their (and our) youth, tend to be the first to go. It is well known that impacts with some possibly quite important ups and downs have declined significantly (exponentially?) in terms of energy with time, as solar system has generally sorted itself out (except for the possibility of periodic peripheral disruption). Late Heavy Bombardment was 17-19 times older than Manicouagan. Sudbury (not that far away, and not that old, being merely Proterozoic), is still roughly an order of maginitude older (~1849 my./~214 my. = ~8.6). And that was a much larger event. Manicouagan is well into the Phanerozoic (from Greek for "visible, evident life"). Dinosaurs were around, and if not for a bit of bad subsequent luck, might be having this conversation. Phanerozoic is very small portion of Earth's history. still a great APOD, was just trying to do a little fact-checking here. In any case not statistically or geologically meaningful, because ALL rocks, of any origin, become much scarcer with time, due to plate tectonics and erosion. Whatever meaning the observation has depends on context. I was simply pointing out that this crater, is, in fact, one of the oldest known craters on Earth. On a separate note, Vega is the bright star just peeking between the very top, near-center edge of the picture and the ISS, and γ Lyr is the brightest star just visible under the ISS inside the triangular structure. The Northern Cross is visible (less one star), Vulpecula and part of Ophiuchus. If you like a star-hop challenge, find Sagitta. Ah, 214 Mya, when Houston Texas was a equatorial swamp.